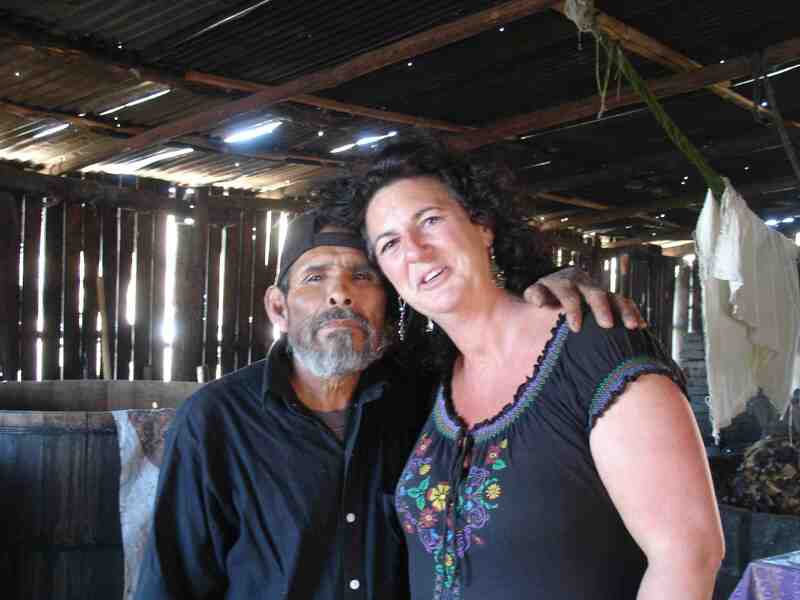 Susan Coss with Maestro Mezcalero Don Pedro Garcia of San Dionesio Ocotepec, Oaxaca. Now I know the series says 5 mezcals, but when someone adds a bonus selection, I’m not gonna cut them off. So here it is, from Susan Coss of Mezcalistas.com, 5 Mezcals Everyone Needs to Experience, plus one! I often get the question – what is your favorite mezcal? My pat answer is the mezcal in front of me because honestly, how do I even answer that question? Many mezcals I have enjoyed are directly tied to an experience or story, and more often than not, are not branded and aren’t available in the US. I had a chance to travel around Sola de Vega last summer and we chanced upon a very off the road palenque – great uncle of someone in the car. His espadin and tobala were bold and huge and definitely not for the faint of heart, I am still rationing my sips as I know I will never have it again. Aguas del Corazon – Pretty much any of their very small batch mezcals are a crowd pleaser but specifically right now the Coyote. So very very distinctive and strong and always a hit with private tastings I host. Siete Misterios – The Mexicano. I had a chance to try it at the recent Mexico in a Bottle in New York City. (full disclosure – Mezcalistas produced this event.) The only words I have to describe it – WTF was that? So very different than any Mexicano I have had before – more herbaceous and green than what I am used to with Mexicanos. Don Pedro Garcia – His espadin is one of my all time favorites – so smooth and sweet. I’ll admit to bias as he asked me to marry me when we first met and became the inspiration for a t-shirt design. Maestros del Mezcal – The Chato from Sosima Olivera Agullar and the Madrecuixe from Reyna Sanchez. Two very interesting mezcals and a testament to what women are doing within the industry. Del Maguey – A new espadin as part of their Vinos del Mezcal line from a producer in the Mixteca, and soon to be available in the US which is pretty awesome and amazing as very little of the mezcals in the Mixteca region of Oaxaca make it out of the region. In Situ – the Verde that Ulises Torrentera has from Don Francisco is always on my list to try and get whenever I am in Oaxaca. It is a total flavor bomb and I can sip it for hours. I also have to give a final call out for, well, a tequila. I had a chance to try a new tequila from Fortaleza that I was convinced was actually a mezcal because it was so meaty and roasty and tasted nothing like any tequila I have ever had. The resurgence of traditionally produced tequilas hitting the market now is one of the most exciting things happening. Visit Susan and Mezcalistas on their blog here! That In Situ Verde is a favourite of mine for sure. Tried it at a restaurant in Mérida called Apoala and have been daydreaming about it ever since.